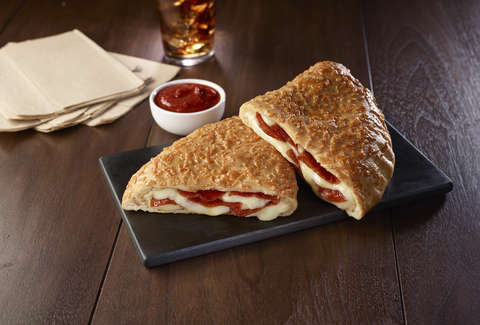 Seventeen years after it first debuted and eight years since it last made an appearance, the Pizza Hut P'Zone calzone is coming back. The chain announced on March 18 that it's back as part of its March Madness promotion, which is, fittingly, celebrating dramatic comebacks. The calzones feature classic Pizza Hut crust wrapping gobs of melted cheese and toppings. They come in three varieties, all of which are accompanied by marinara sauce for dipping. There's Pepperoni, Meaty, and Supremo. "March Madness is one of the most captivating sports moments of the year," said Pizza Hut's chief brand officer Marianne Radley in a statement. "We are excited to bring back the P’Zone as part of our $5 Line-up during a time when family and friends will be gathering in anticipation and excitement." Additionally, Pizza Hut is scratching your nostalgia itch during the tournament by foregrounding its long-running Book It! program along with The Literacy Project, which seeks to enable access to books and educational resources globally. In conjunction with Book It!, Pizza Hut is donating $20,000 to First Book, a nonprofit that seeks to provide equal access to education for kids. Calzones, they're great for college basketball games, literacy, and trying to forget headlines like "Ice Town Loses Ice Clown His Town Crown."